The Light L16 is the world’s first multi-aperture computational camera. It combines an ergonomically refined case, breakthrough optics and the most advanced imaging engine ever created to bring DSLR image quality to a pocket-size form factor. Sixteen image sensors span wide angle, mid and telephoto ranges. There are no extra lenses to carry or change. Based on focal distance, each shutter click captures up to 10 images, which are then fused into a high-resolution photo that can be refocused and adjusted with the Light editing software. Each shot yields infinite photographic outcomes. 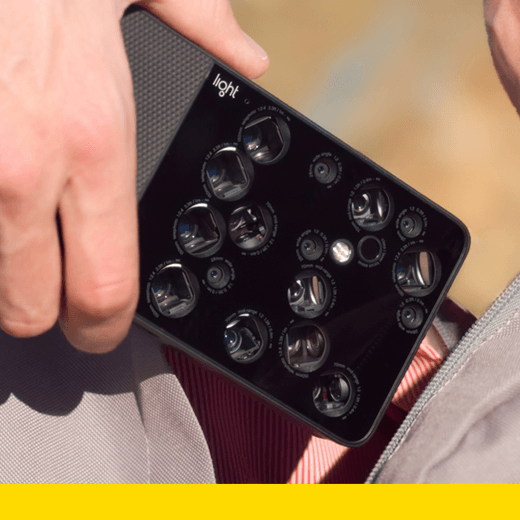 The design objective was to integrate Light’s groundbreaking optics and image processing technology into a refined easy-to-use camera to satisfy the most discerning photography enthusiasts among us. Every facet of the physical interaction and technology integration demanded the utmost care to ensure an authentic, pleasing camera experience.